The Dolce Vita Hotels are 5 family-run activity and wellness hotels in South Tyrol which have grouped together under an umbrella brand in order to provide you with high-end holidays. Enjoy the sweet life and come to the Dolce Vita Hotels in Völlan, Naturns and Latsch near Merano. You will be delighted about the attractive holiday offers and prices – and the friendly and professional staff at the Dolce Vita Hotels looks forward to welcome you soon. 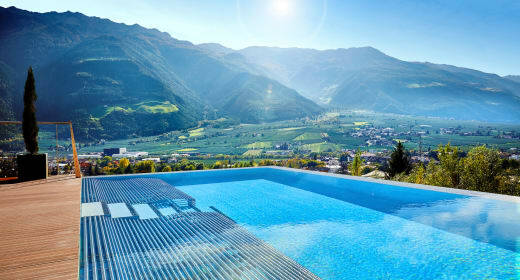 “La Dolce Vita“ – the focus is on you at the DolceVita Hotels in South Tyrol. Your wellbeing and holiday bliss take centre stage here. Make one of the 5 wellness hotels in South Tyrol your holiday residence and enjoy the amenities and advantages which this group of hotels provides exclusively to you. The DolceVita Hotels Alpiana, Preidlhof, Lindenhof, Jagdhof and Feldhof score with Four Star Superior comfort, attractive services and offers for your activity and wellness holiday in South Tyrol. Benefit from our free of charge Around offer. Discounts of 5-15% at the best shops in Merano, Naturns and Latsch. We offer special excursions to the most beautiful places in South Tyrol exclusively for DolceVita guests. 24 pools, 31 saunas, 3 SkySpas ... all that exclusively for DolceVita guests. The 5 Dolce Vita Hotels in South Tyrol are situated in the sun-kissed Merano Region which is surrounded by mighty mountain ranges. Cypresses, palm trees and vines in the valley, snow and ice on the peaks of the mountains – multi-facetted South Tyrol is the ideal region for a diverse sports and activity holiday. A loggia view to the majestic mountain panorama and the basin of the Vinschgau District and Merano Region provide the light-flooded wellness areas at the Dolce Vita Hotels. Make use of the many wellness offers at the Dolce Vita Hotels: enjoy modern wellness comfort and the beauty pampering programme with hotel-own, as organic certified BERG cosmetic range.